Themar sits more or less in the middle of the state of Thüringen and also more or less in the middle of Germany. 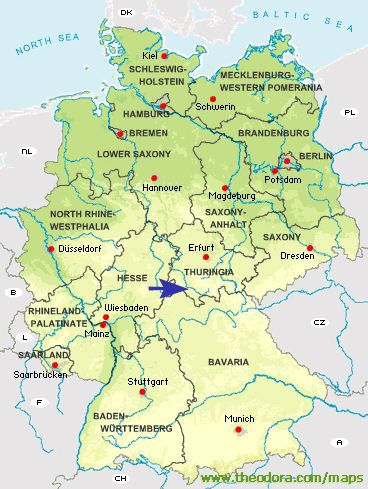 As a centre of 3,000 people, it’s not big enough to be on the map of Germany below but Themar is 120 km to the southwest of Erfurt at the blue arrow. 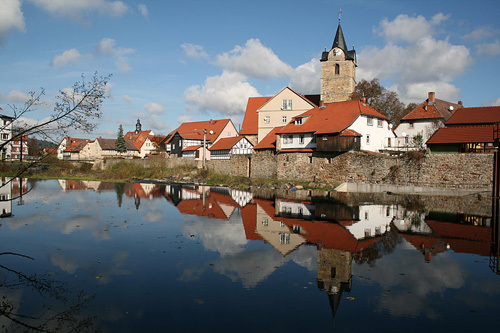 Records as early as 798 mention a settlement called ‘Tagamari,’ aka Themar, and emphasize its great location on the Werra River. 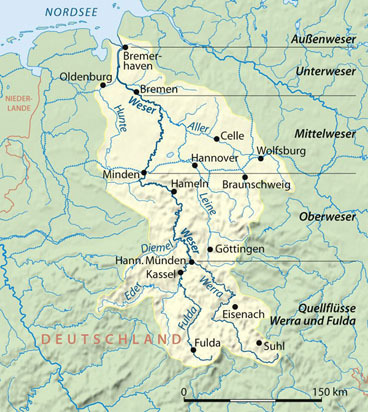 The source of the Werra River was Eisfeld, from where it flowed north from the right into the Weser River (the Fulda River flowed from the left); together, they formed a 744 km-long north-south economic artery. Against a shifting landscape of regional identity for Thüringen — for centuries at best a geographical concept — Themar developed its own strong sense of identity. As early as 1303, Themar residents were called citizens; in 1317, the city acquired municipal rights. Economic activity included fishing, regulated by the nobility, agricultural activities and complementary craft activities. There were three mills, a brewery (est. 1356), a butcher (est. 1463), a blacksmith, and a spa, not only for bathing, but also for medical benefits. In the mid-15th century, clothmaking (‘Tuchmacherei’), which acquired guild status in 1478, became the most important economic activity and remained so for the next couple of centuries. 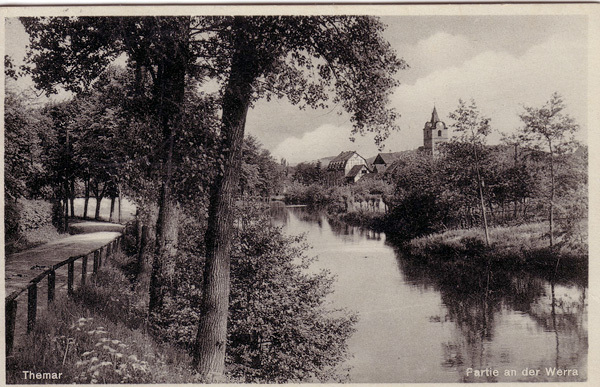 The Werra River was used for rafting goods. The moods of the Werra from idyllic pastoral party scene (top) to rising waters (middle) to Venice-in-Themar floods. 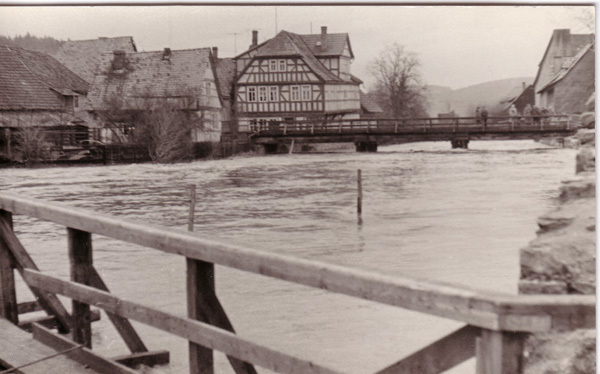 Floods still occur regularly in Themar. Source: City of Themar. The look of the city reflected its strong sense of self. Institutional buildings, such as those of the dominant religion, Christianity, appeared; in 1416, the St. Bartholomew Chapel was built, followed by the St. Bartholomew Church in 1488; in 1418, the upper church, and the cemetery church (Friedhofskirche) appeared. Military fortifications appeared: in 1439, the Counts of Henneberg started constructing the first fortifications around the city, albeit only from wood. When more feuds required better protection, they hoped that construction of a permanent wall and towers, begun in 1457, would provide protection. 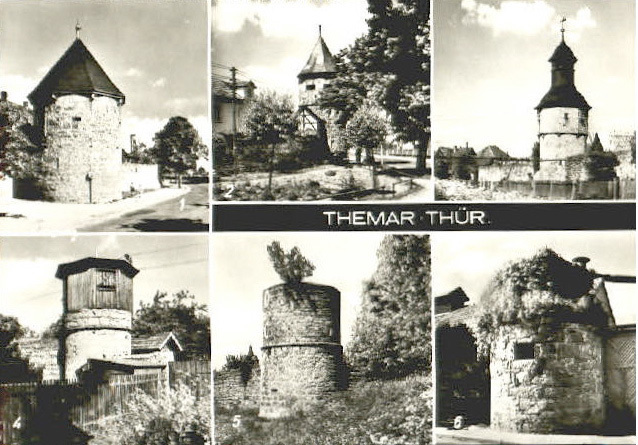 The towers of Themar as they appeared in a post-WWII postcard. The 7th tower is an integral part of a house and is not shown on this card. The towers have always been the central image of the city’s coat of arms. The walls and towers were, however, of no help whatsoever during the Thirty Years War (1618-1648). In 1634, the attacks by General Isolani and his Croatian troops killed 246 of the 280 families and, in a sustained assault on 16 October 1634, the physical city was virtually eliminated as well — 231 of the 300 houses were razed. Of the public buildings only St. Bartholomew’s Church escaped, and that only because the attackers halted destruction when they saw the magnificent altar shrines. Themar rebounded after the end of the war, transforming itself from a rural agricultural centre into a small industrial city. Clothmaking, which had remained strong until 1624, was replaced by new activities. Flour- and sawmills appeared; many trades — butchers, bakers, blacksmiths, carpenters — and small factories — basketworks, brickworks, breweries — developed. From the 17th to the 19th century, north-south trade along the Weser and Werra rivers flourished under the Hanseatic League. 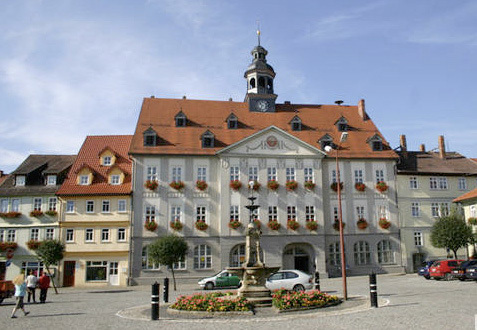 CIvic building continued to reflect civic pride: the Amtshaus was completed by 1665 and a “new” City Hall by 1711. 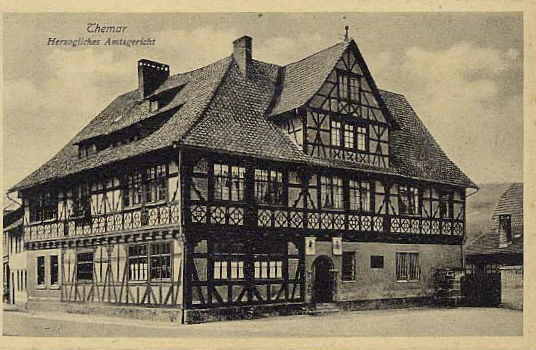 Amtshaus in “Hennebergisch-Fränkischen Fachwerkbaustil,” built in 1665. Source: City of Themar. The “new” City Hall of 1711, as seen in 2008. It replaced the first City Hall, built in 1608, which had in turn replaced sales booths built by craftsmen on the market square. Credit: City of Themar. The construction of railways in the 1850s modifed its dependence on the river and linked Themar to northern and southern markets in the interior. The effect on the economy was significant: by the end of the 19th century, Themar was known as “Furniture City,” thanks to the many craft-related, small and medium-sized enterprises in furniture manufacturing. Other companies, in fields such as tanning and engineering, developed after the First World War. The city streets, houses and public buildings, such as the Business School (‘Städtische Beamtenschule’), reflected Themar’s status as a prosperous centre. Themar Railway Station. 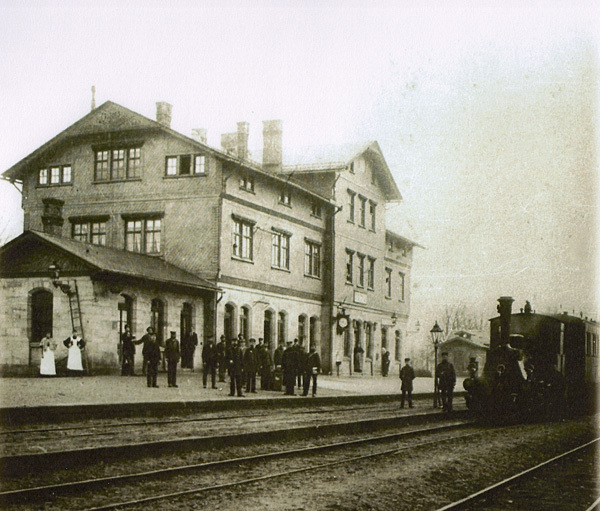 In the 1850s, the Werra River Railway included Themar on its Eisenach-Coburg railway. The Plaue-Themar railway linked Themar to northeastern centres of importance. Source: City of Themar. 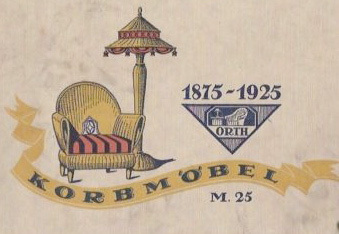 Catalogue for Otto Räder Furniture Factory c. 1925. 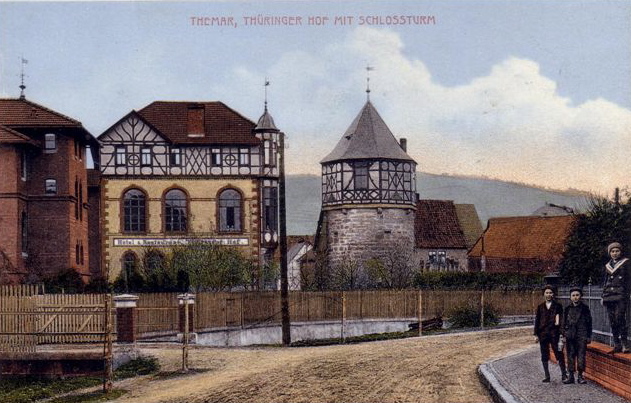 Schlossturm/Castle Tower & Thüringer Hof, Pre-WWI. The Hof was destroyed in WWII and the upper levels of the tower damaged. Source: Stubenrauch Collection, Themar. The economy of Themar in the early 21st century is based in its history and heritage and in its superb location for recreational activities. 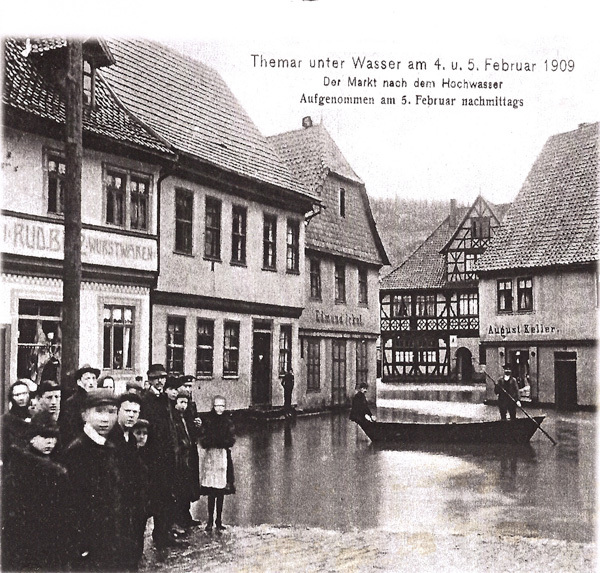 For more historical pictures and postcards of Themar, see the 1936 City Map drawn by Manfred Rosengarten with its pictures, and the text and photographs of Rosengarten’s 1987 memoir, Themar, Thüringen: My Home Town. More pictures of the city as it is today can be found at the city’s website and at Linda 6769. 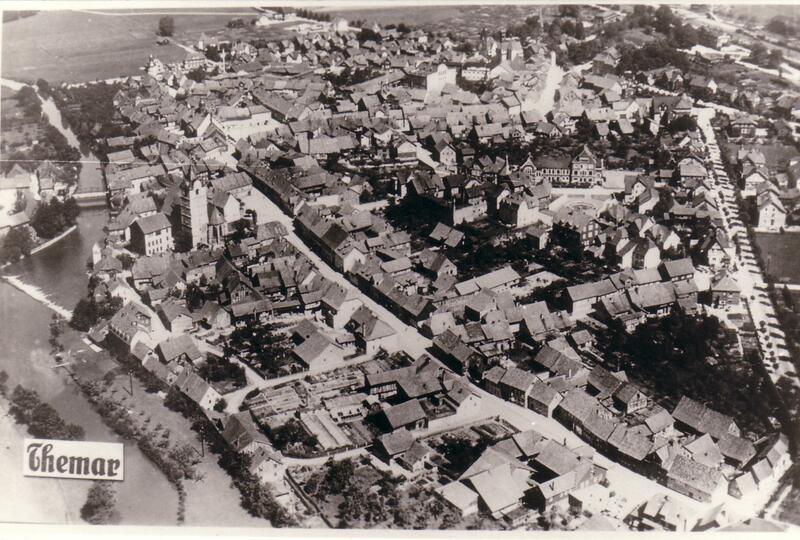 Aerial view pre-WWII. Source: Stubenrauch Collection, Themar.